There are huge and troubling resonances throughout the Lyceum’s startling Cockpit. Fascinating staging and committed performances make for a thoroughly vital production – albeit one that falls tantalisingly short of greatness. Bridget Boland’s play, first performed in 1948 and never seen since, demands a site-specific performance. 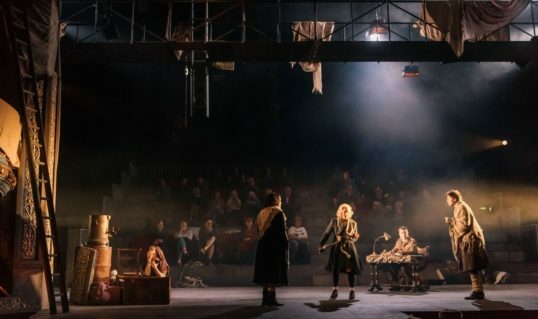 The twist is that the site is a theatre – a German playhouse requisitioned by the Allied forces at the end of the Second World War to house ‘displaced persons’ before their transport back east or west. With the aid of Ana Ines Jabares-Pita’s tremendous design, director Wils Wilson has transformed the entire auditorium. Banners and ladders hang from the circle, performers appear from the stalls, and there are audience members on the stage. The audience are addressed as the ‘displaced people’ – while this has the value of implicating everyone in the narrative, it does not quite work as a conceit through the whole show. Despite the effect of Matt Padden’s sound design, this never quite has a completely ‘immersive’ feel. The onstage spectators, in particular, serve as more of a distraction than they should. Fortunately, the events onstage (and, indeed, offstage) make up for it. Outside forces sometimes unite, sometimes divide the pan-European cast of characters. Conflicts between Chetniks and Partisans, between Poles and Russians, between French Resistance and suspected collaborators, undermine the efforts of the British soldiers supposedly in charge to keep the peace. As we are pointedly told, the British ‘don’t understand Europe’. This is just one of the elements of the script that make it as sadly relevant now as in 1948. The issues raised here mean it will never be an easy production to watch, and knowledge of what has happened since just adds poignancy – that we know the fears of those about to be sent to the Russian zone were entirely justified just adds to the immediacy. The later explosion of Yugoslavia, attempts to unify the continent and the recent resurfacing of nationalism across Europe all make this even more important now than it was when it was written. Which is not to say it is a perfect piece of writing by any means, or even a ‘lost classic’. Much of the characterisation is decidedly sketchy, the narrative flirts needlessly with melodrama, and the points about the dangers of certainty are themselves far from subtle. The second half is in real danger of collapsing in on itself at times. That it works so well here is down to Wilson’s bravura directing and a tremendous cast. Peter Hannah, as the harassed British commander, has a wounded, uncomprehending dignity, while Deka Walmsley gives his seen-it-all-before sergeant a believably grudging humanity. There are very fine performances throughout, from Sandra Kassman’s mysterious amnesiac woman to Krystian Godlewski’s Polish camp survivor and Kaja Pecnik as his wife. Dylan Read gives the finicky stage manager Bauer more depth than the character probably deserves, while also turning in a diametrically opposed characterisation as suspected collaborator Duval; the doubling of roles is a particularly well-handled aspect of the production. 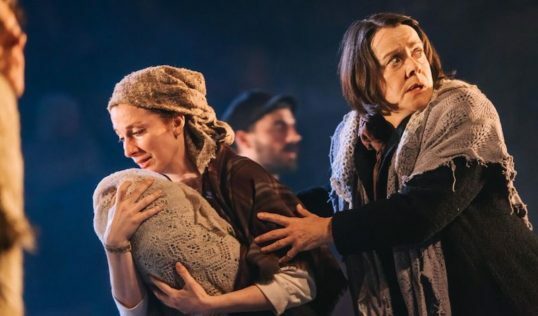 Music – led by Aly Macrae – is brilliantly used, with the Eastern European folk songs of the first half being the stand-out moments of the whole production. This is one of those productions where, despite the brilliant craft on display, chaos is always in danger of taking over. Which is entirely the point – the weakest moments are those, like the lame jokes about front of house staff, when it is closest to being a play about theatre. The strongest points are when it surrenders to the whole messy business of humanity. Both profoundly dispiriting and oddly encouraging in its examination of human nature, this is a production that needs to be seen. Tues – Sat evenings at 7.30 pm. Matinees Wed and Sat at 2.00 pm. I saw this tonight and was one of the stage spectators. I definitely felt more involved, although sometimes the actors had their backs to us. I thought it was a very interesting piece of theatre but didn’t feel emotionally invested in the characters, so would agree that, although impeccably acted by the whole ensemble, they were too sketchily drawn. Very glad I saw it though.